ODESSA, Ukraine -- The Ukrainian city of Odessa has unveiled the world's second public monument to late Apple Inc. co-founder Steve Jobs. The Ukrainian city of Odessa has unveiled the world's second public monument to late Apple co-founder Steve Jobs. 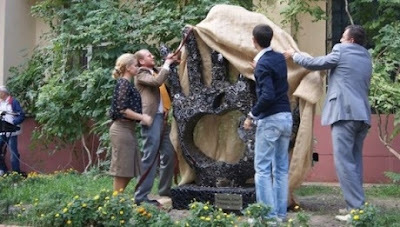 The 200-kg, two-metre-high metal monument is shaped like an open palm, with Apple's logo, an apple with a bite mark, cut through it, the Odessa administration reported on its website. The sculpture titled "Thanks, Steve!" was welded from bits of scrap metal, including screws, nuts, bearings and even an ax, and is illuminated at night by white-and-blue lights. The artwork, created by local artist Kirill Maximenko, was installed in front of a college on Novoselskaya Street Friday, which marked the first anniversary of Jobs' death due to cancer at the age of 56. The world's first public monument to Jobs was presented in Budapest last December. The Russian cities of St. Petersburg and Novosibirsk have also announced plans to honour Jobs with statues.